Since the untimely death of Lorenzo Bandini Italians haven't exactly shone when driving for Ferrari, Michele Alboreto's runner-up position in the 1985 championship the single exception to the rule. Having said that, the legendary team hasn't really given a chance to home drivers to show their skill. Most of the time they were called in as a stop-gap or replacement driver - Larini, Capelli and Morbidelli are fine examples from recent history - and for Nanni Galli it was just the same. Like his unfortunate countryman Ignazio Giunti, Giovanni Galli was a steady performer in Ferrari's sportscar team of the late sixties, using his nickname 'Nanni' to confuse his family, which disapproved of his racing career. Just as it happened with triple World Champion Nelson Soutomayor, adopting his mother's last name to avoid the wrath of his father and to escape life as a mediocre tennis player, the nickname stuck. While Giunti pulled the shortest straw after just four races for Ferrari in 1970, being dumped in favour of the young Regazzoni, Galli was drafted in from the sportscar squad to replace the indisposed Rega at the 1972 Austrian GP. He got just the one opportunity to make his mark - and failed to do so. He qualified poorly in 21st and in the race could not manage more than a lowly 13th. After that single performance for Maranello Galli tumbled back down to where he had been before: at the back of the grid, soldiering on with the difficult F12 Tecno, after an inauspicious first GP season with March. 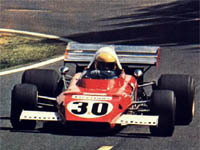 1973 proved to be his last season, driving the cumbersome Iso-Marlboro FX3 for Frank Williams, before suddenly announcing his retirement and quitting the sport altogether, only returning to the cockpit in 1974, at the wheel of an Abarth sportscar. Nanni Galli's F1 career was not exactly what you can call successful, though he did get the chance to drive for the Scuderia Ferrari on one occasion, when Clay Regazzoni's wrist was injured in a soccer game. Interesting enough, Galli and Regazzoni collided the race before. The history of the Ferrari 312 is also interesting. Appearing in 3 versions, the B1 was the most successfull when Ickx finished runner-up in the 1970 season. The B2 was thought to be an improvement, but the results didn't quite follow, as Galli here drove the car only to 13th place. The B2 had an interesting feature: the rollbar was connected to the rear wing - however this is not easily spotted on this picture.